I use the 'geektool' programme for Mac OS X. This lets me do lots of nice things to my desktop - information is embedded in the desktop - sometimes discretely, sometimes not. 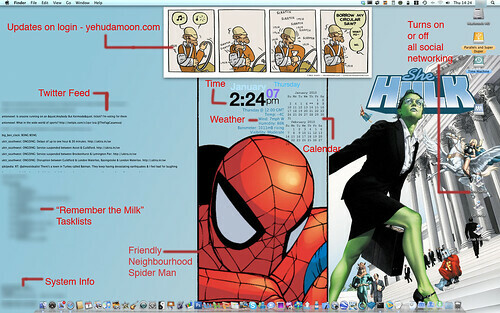 This is (approximately) what my desktop looks like now. It has a twitter feed, a calendar, date and time, to do list, system specs, hard drive usage etc and a daily cartoon that updates. Since this screenshot I've added live departure times for my local train station. The result is below. It works, and I know it can probably be done more simply - but to be honest, I'm pretty pleased I got it working. I'm sure there is a more elegant way of first identifying, then stripping out the HTML. Essentially, once I got this working on the command line, I told geektool to run it from time to time and embed the result in my desktop. If anyone needs it, I'll shove up my train departure script too.